Choreographed in 1917 by J. A. Smithers of the Leigh House Academy in Sydney, Australia, the Allies' Waltz is an early sequence dance in honor of the Allies in World War I, particularly the Australian and New Zealand Army Corps (ANZAC), who fought in the Gallipoli campaign against the Ottoman Empire. Today, many things are named after ANZAC, including ANZAC Day (April 25), ANZAC biscuits, and even the occasional koala. It is step-for-step identical to the earlier Waltz Amelia. 2 bars: A solo waltz forward, rolling away from your partner, Lead turning to the left, Follow to the right, then face partners, holding both hands. 2 bars: A gliding side step along LOD (1), then a gliding side step against LOD (4). 4 bars: Repeat the first four bars. 2 bars: Take partner in closed position and waltz one full turn. 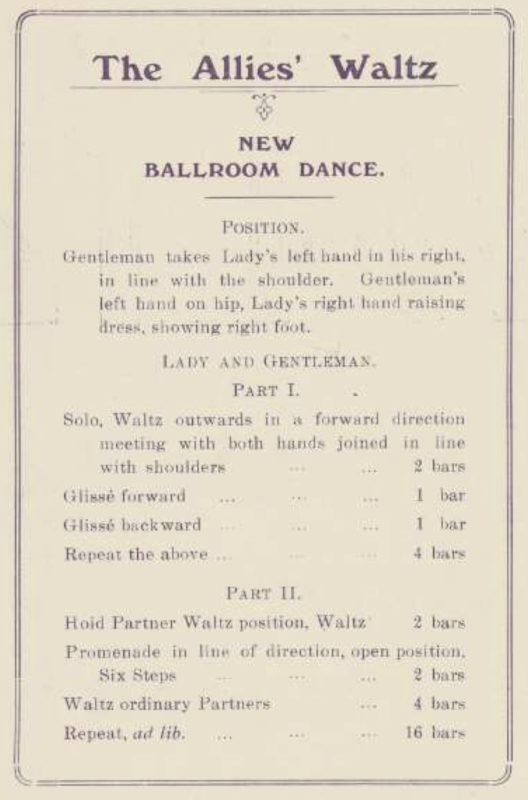 * Though not specified, this works nicely as a slight vis à vis: facing slightly away from partner on the first three steps, and facing partner on the second three. 4 bars: Close up to waltz position and waltz two full turns. Repeat it all from the beginning. "The Allies' Waltz" by J. A. Smithers is the original tune, but it can also be danced to any rotary waltz with continual eight-bar phrases. J. A. Smithers. (1917). 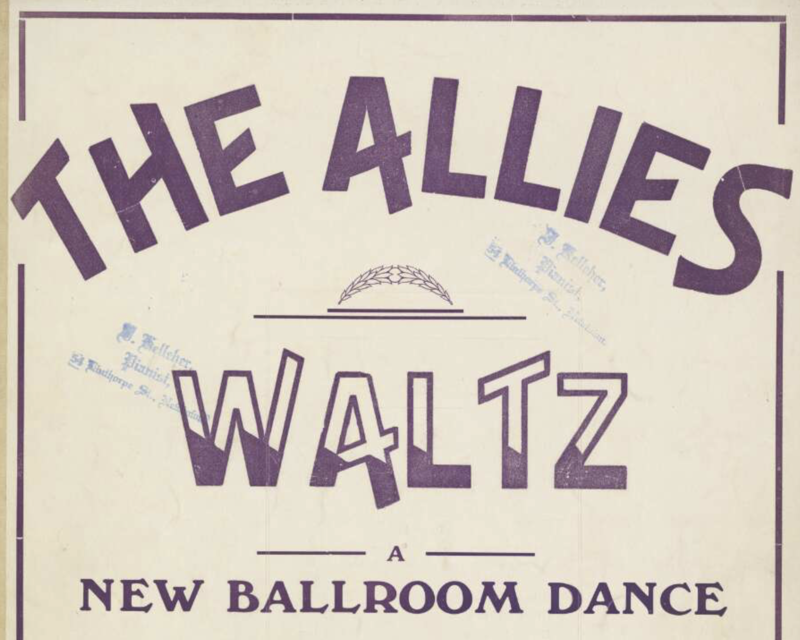 The Allies Waltz, A New Ballroom Dance. Balmain, Australia.